Mom picked me up yesterday afternoon and greeted me with a beautiful Tubarose Lei (one of my favorites flowers) and we had a lovely time catching up over lunch at Duke’s Restaurant in Waikiki Beach. It’s strange to be a tourist in a land I once called home. I used to feel compelled to tell anyone trying to give me the “Aloha, welcome to Hawaii” speech that “I am from here”. These days, I am not so eager to prove my Kamaiina (local) status as I am just wanting to soak it all in. The drive from the airport to Waikiki was interesting. I rode past Sand Island Street – where I worked [as a stripper] for a few months. I drove my little moped all the way out to the airport to work there. I forgot about that moped and all those nights driving at 3:00 am with a bag full of dollar bills in tow. 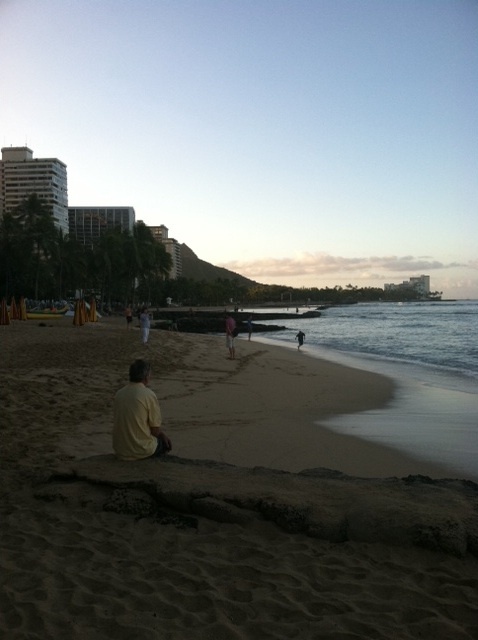 Being here in Waikiki has delivered so many memories. Within the walls of nearly every building is a story where I once played a part. I have either lived, partied, or both in so many of them it’s hard to differentiate between the hazy lines of my past. Then there is the irony. Up since 5:30 am Hawaiian Time (8:30 am PT) this morning, I went for coffee and eggs at Denny’s on Kuhio Avenue. I used to end my nights there at 4:00 am, so it was familiar territory at such an early (or late) hour. As soon as I walked in the restaurant, I spotted two 20-something girls in a booth by the window. I immediately pegged them as strippers who were out for breakfast after a long night’s work. My assumptions proved spot on, as I sat in the booth next to them and overheard their conversation. I thought of how many nights I sat in this very restaurant with co-workers talking about customers, tips, and the other dancers. By the time I left the restaurant the sun was peaking out, stretching her arms slowly above Diamond Head, so I decided to take a walk along beach. I wasn’t surprised to see joggers on the sidewalk at this hour. I remember when I used to party all night until 7:00 am and seeing the joggers was a sign that I needed to go home. There were tourists sipping coffee, walking on the sand and taking photos – so I grabbed my camera and shot some photos right along with them. Being up at dawn in Waikiki SOBER is a first for me. It feels good to walk along the early-risers without being high on cocaine. As I walked back from the beach, I realized how nice it was that I didn’t have to hide myself from anyone this morning. This got me thinking. Perhaps this trip is more than an excursion of a place where I once lived, but rather, it’s a journey back to my true self. To read the continuation of my journey back home click here. What I take from this post is that you've come full circle. You left there as one person, and now you're back as someone else. It sounds like you really enjoyed being on that beach this time. I agree with Matty. My circumstances were different yet similar when I traveled back to my boarding school in Northern Ireland. Sounds like your trip, thus far, is going smoothly. Hope that continues and that you find some good conversation and answers. I agree about coming back full circle and having a new perspective based on all those stories and experiences you just described. I think "going home" as it were, is as essential to a person's growth, re-birth or recovery as changing the other more "unhealthy" aspects of our lives.I've re-visited some of my "old places" as well and though I sometimes felt a bit strange or a little out of place, they have always been good experiences for me. I have learned a lot about myself by going to the "old world" as my "new self" though as you described in your Denny's encounter with the girls…it can seem somewhat surreal as well. I hope your visit back to those places/time works just as well for you.Enjoy your time there and thanks for this, another open, honest and insightful post…. You spelled Kama'aina wrong :PWere you born in Hawaii? What a beautiful place! Isn't funny how the more it changes, the more we notice the things that don't change?The only time I ever saw Waikiki beach from that point of view that early in the morning was a time when I'd slept on the beach because I'd been too wasted to catch the bus back to PH and the cops had kicked me out of the public changing room across from where the Catholic church is. That changing room isn't even there any more.